Having yoghurt, fruit and granola is one of my favourite breakfasts or a yummy granola on top of a smoothie bowl is also a go to! Especially coming into summer, having this in the pantry is really ideal and so versatile! Don’t get me wrong, I love some brands of granola but I find it is so hard to find ones that don’t break the bank and that aren’t ladened with sugar! I picked up a new product the other day in the supermarket, it was a 4 star health rated granola and it sounded amaze!! But guys, it was sweetened with SUGAR and GOLDEN SYRUP!! Not ideal, the amount of sugar you would get in a serving was over your recommend daily intake! So, while making granola at home isn’t as convenient as just buying one of the shelf, TRUST me when I say it’s worth it! This recipe is super easy and is flexible if you want to add or omit ingredients depending on your health requirements or if you’re allergic to certain nuts for example! 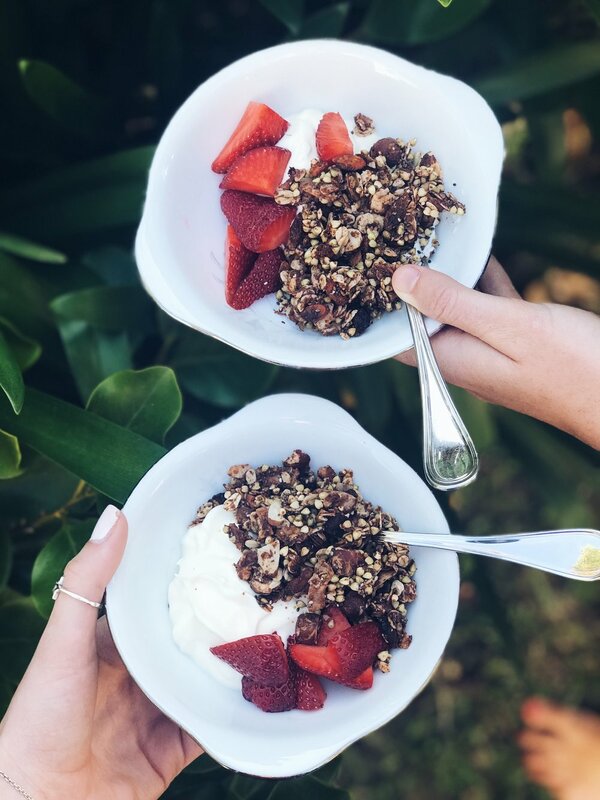 I was determined to make a delish granola that all the family would enjoy and I think I'm onto a winner but I look forward to hearing what you think! Enjoy but not all at once! If you’re on a budget, PAMS have a really good superfood range which is really affordable and good quality or source out ingredients from health food stores like bin inn, which may be cheaper than the supermarket - do your research though! Make sure your vanilla extract has no sugar added! I cannot wait to see you enjoying this recipe!